After a merger of media interests, Einar has been sent from Reykjavik, along with an editor and photographer, to Akureyri in the north of Iceland to help cover the area more effectively and boost sales. He’s a reluctant migrant to provincial life, but hopes it’ll help get his career and life back on track after a couple of years of stagnation and too much drink. His initial stories are a school play of Loftur the Sorcerer, an allegorical tale of narcissistic power, the death of a woman who fell overboard whilst white water rafting on a work bonding trip, and violent clashes between locals and foreign labourers in Reydargerdi, where a new industrial plant is being built. Each story seems relatively benign and nothing unusual in the general run of things. However, the woman’s mother insists that her daughter’s husband killed her, contrary to all the evidence, and the charismatic lead actor in the play is murdered soon after, the body dumped and set on fire in a local junkyard. Einar starts to investigate each case, hoping that he might land a scoop that will see him recalled to the big city. 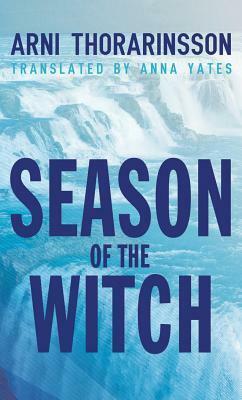 Season of the Witch is a mildly entertaining tale set in the north of Iceland. It’s what I would characterise as an ‘okay’ story: it whiled away a few hours without every really capturing the imagination. The story suffers from three main issues. First, the main character is bland and nondescript and is not conflicted enough with respect to his ostracisation to the north, his ‘odd couple’ relationship with his news editor, or staying on the wagon with respect to drinking. Moreover, the author tries to cast him as both a worldly rebel and a decent, moral conservative, and he’s really the latter. The result is a character that doesn’t ring true, who’s difficult to connect to or identify with. The other characters also seem quite weak and superficial in their portrayal. Second, the story is drawn out and meandering and lacks pace and tension. Moreover, the plot just about holds together, but it becomes thin at times. Third, the writing is quite pedestrian, although it does have some nice observations at times, especially when it discusses the play the students are putting on and Icelandic lore. The overall effect is an investigative journalist story that never really seems credible or sparks into life.